This box pleat faux silk 20″ lamp shade is offered in a choice of six stunning colours and and features a 10cm duplex ring that requires a shade carrier. A suitable shade carrier can be found by following this link to our Lighting Accessories section. A classic 50cm empire shade, box pleated and fully lined, with satin ribbon finishing the top and bottom edging. 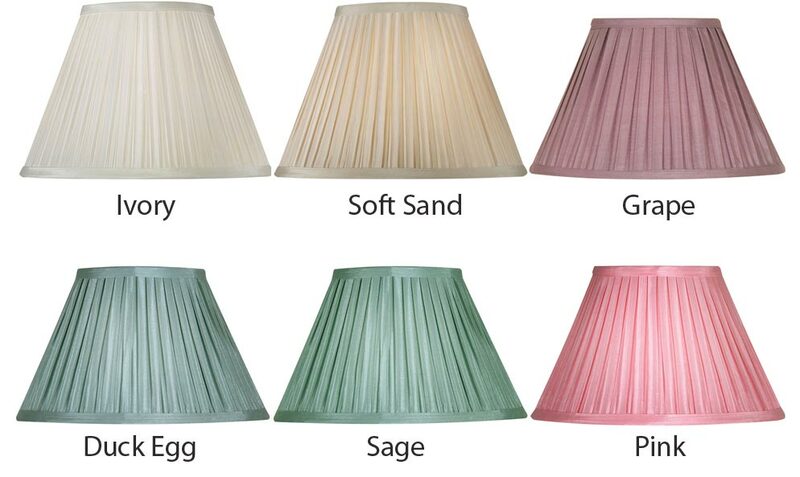 Quality shades that will help you give a new lease of life to your favourite floor lamp. Available in a choice of colours including ivory, soft sand, grape, duck egg, sage and pink. Please see the image and let us know your choice in the special instructions box at checkout. Sometimes it is hard to imagine the size when choosing from an image; it may help to make a cut out using the measurements given below. Quality co-ordinated lamp shades available in a variety of sizes suitable for floor lamps, wall lights, chandeliers and table lamps, please see below.